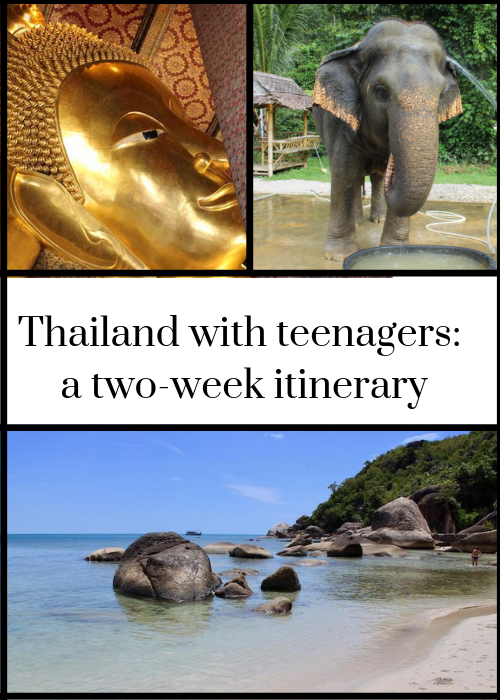 If you’re planning a summer family holiday with a teenager, have you thought about Thailand? 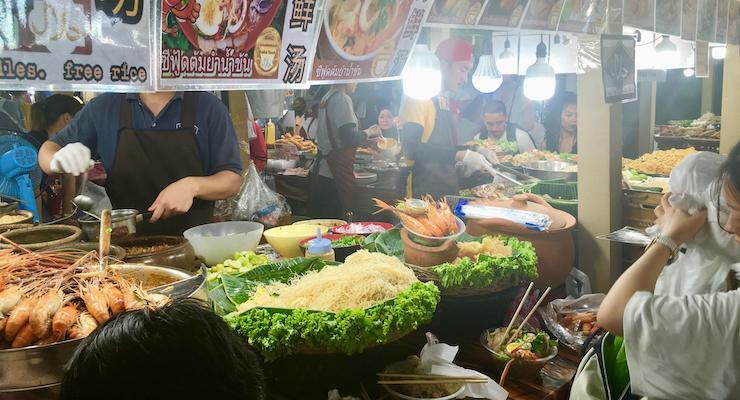 This south-east Asian country is a friendly and welcoming place to explore, the food’s amazing, it has more than 5,000 miles of coastline and it offers great value. 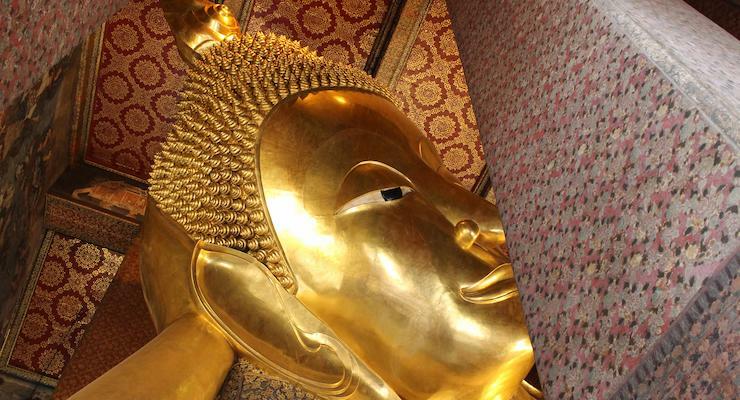 I spent two great weeks in Thailand on a summer trip with my husband and our two kids, age 20 and 15. I planned the trip carefully to try to keep the whole family happy. 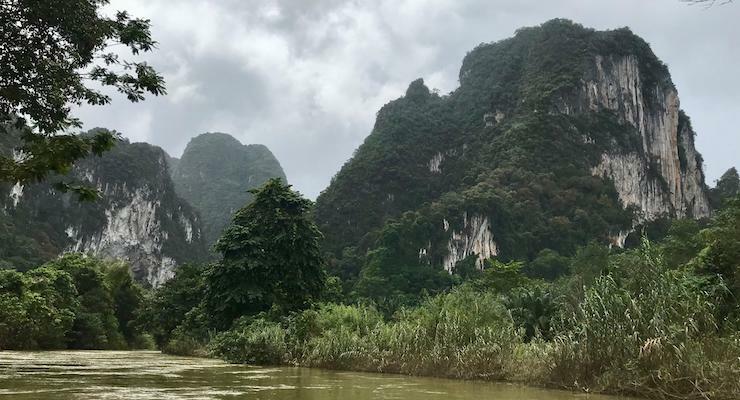 We wanted to avoid the rainy season as far as possible, and to explore different aspects of the country without travelling around so much that it became exhausting rather than relaxing. I booked the trip independently, apart from our stay in Koh Samui, which was arranged by our very helpful local Kuoni travel agent. The trip went very well, everywhere that we stayed was excellent, and we had some amazing experiences which I will always remember. In case you’re researching a similar trip, I’m sharing our itinerary with you here. Do let me know if you have any questions about our trip. We flew with British Airways direct from Heathrow to Bangkok. The flight took just under 12 hours, and we arrived first thing in the morning at Bangkok Suvarnabhumi Airport. Thailand is six hours ahead of the UK. 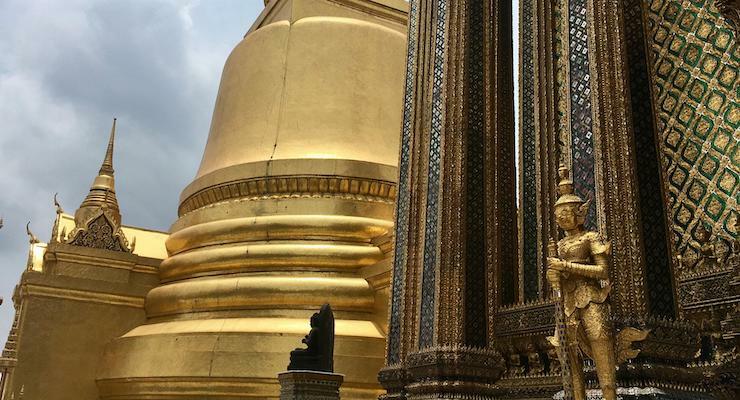 In Bangkok we enjoyed sightseeing at the historic Old City, shopping for bargains at the Platinum Mall and exploring traditional street food markets and religious shrines. After two nights in the city, we took a taxi back to Suvarnabhumi airport and caught a Thai Airways flight south to Surat Thani. The flight took just over an hour. 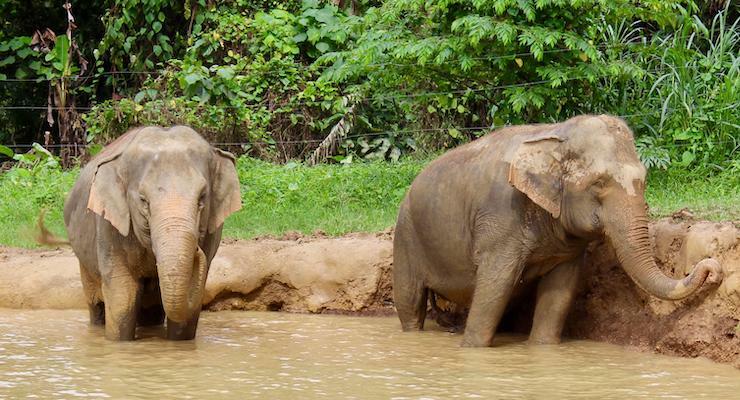 Elephant Hills provide onward transfers for guests. 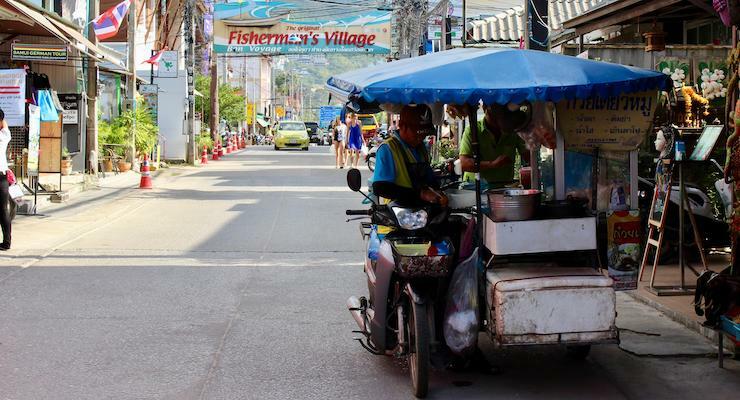 For us that meant a minibus journey to Donsak Pier, a two-hour ferry crossing from the mainland to the island of Koh Samui and then a taxi from the port to The Tongsai Bay, our next hotel. The Tongsai Bay is a luxury hotel in a private bay in the north-east corner of Koh Samui. Family-owned and run, the secluded resort has three restaurants, a spa, a gym, two swimming pools, non-motorised water sports, a tennis court, a games room and very good Wi-Fi. Each of the resort’s villas, suites and cottages has its own private terrace and sea views. We stayed in a beautiful two-bedroom villa with a pool. 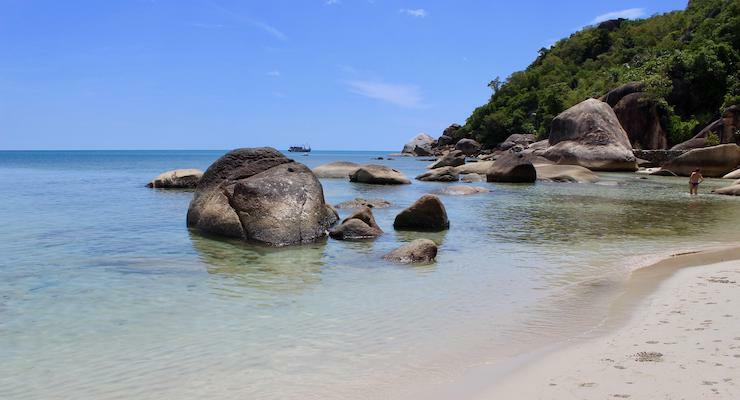 If you want to do so, there are many activities to take part in at The Tongsai Bay – I particularly enjoyed the Thai language class, Thai cooking class, and a Thai massage on the beach. The vegetarian and vegan dishes on offer were very good, and sunset cocktails were a daily highlight. This part of our trip was arranged by tour operator Kuoni, and it was very helpful to have advice both from our local Kuoni travel agent before our holiday, and from their local rep while we were there. The Tongsai Bay is a gorgeous, peaceful and relaxing place, and I loved staying there. When we could tear ourselves away from the hotel, we also explored Koh Samui, hiring a car one day, and using taxis on other occasions. There are some beautiful beaches on the island, and my daughter and I enjoyed the market at Fisherman’s Village. Kuoni arranged our transfer to Koh Samui airport. A taxi picked us up from the hotel, and we were met at the airport by a very efficient local rep who helped us to check-in and find our way to the departure lounge. We flew with Bangkok Airways back from Koh Samui to Bangkok Suvarnabhumi Airport. (I’d booked our flight from Koh Samui to Bangkok with Thai Airways, months before, but when I tried to check-in online the day before our flight, I discovered that the airline had switched us to Bangkok Airways. The Tongsai Bay reception staff helped me with this – a lot!) The flight took just over an hour. As we arrived in the evening and had a flight the following morning, we had booked an overnight stay at the four-star Novotel Bangkok Suvarnabhumi Airport, which is just across the road from the main terminal building. The hotel is enormous, has excellent facilities and (obviously) is in a great location for the airport. I was particularly impressed with the Novotel’s outdoor pool and the garden. After a quick morning stroll around the hotel, followed by breakfast, we walked across to the terminal to check in for our flight from Bangkok to London. We flew with British Airways to Heathrow, and the flight took around thirteen hours. Once we’d collected our luggage we called the parking meet & greet service. Our car was ready for us to collect from the car park next to the terminal, and we drove home. I loved our trip to Thailand. It was the first time that our kids had travelled beyond Europe and the USA, and the first time that any of us had been to Thailand. It’s a really welcoming and interesting place, it was easy to get around and it felt safe. The people that we met were friendly and helpful. The food was delicious, and there was no problem in finding vegetarian and vegan dishes for me and my daughter. I would definitely recommend Thailand as a holiday destination for families with teenagers and with younger children, and I’d love to go back there and explore different areas. *Disclosure: This post contains some affiliate links, which means that if you clicked through and booked I may receive a small commission. We were hosted by The Tongsai Bay and Kuoni for five nights, at the Amari Watergate for two nights and at the Novotel Bangkok Suvarnabhumi Airport for one night, all on a B&B basis, all for review purposes. We paid for our own flights and other expenses. All opinions, words and images are my own and are completely independent, as ever.